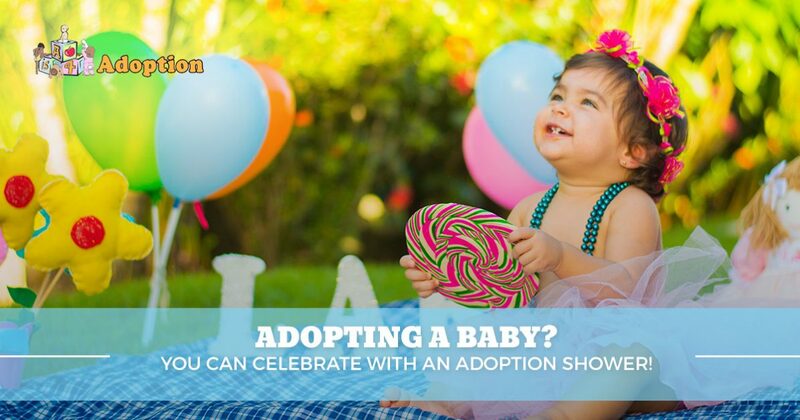 Adoption Agency CA: Celebrate Your Adoption Process With A Baby Shower! Adopting A Baby? You Can Celebrate With An Adoption Shower! For many expecting parents, a baby shower represents the perfect opportunity to celebrate the joy of introducing a new member into the family with friends and loved ones. While baby showers are often joyous occasions, they are traditionally reserved for pregnant mothers. For those unable to have their own children biologically, adopting a baby is one choice that may complicate plans when it comes to hosting a baby shower. While throwing your own celebration after private adoption will require unique considerations, baby showers for adopted children can actually be more rewarding or just as enjoyable as their traditional counterparts. A is 4 Adoption is here to help you through each stage of the adoption process, working diligently to create the perfect matchups in a timely manner to avoid the stress and instability involved with today’s domestic adoption practices. If you are looking for an adoption agency in California, be sure to reach out to our center instead for expert assistance. We work hard to cut through the red tape to deliver more children in need into the arms of more waiting families. Today, we’ll discuss a few basic components of having a baby shower after adopting a child. This celebration can help to excite your family about a new member while also normalizing the concept of adoption. While hosting an adopted baby shower will likely come with a unique set of challenges, it’s important to focus on celebrating your baby and not the adoption process itself. There will be a few key differences, but new parents often report much better success when they try to make the baby shower as normal as possible. Adopting domestically or internationally may tempt you to focus on the culture and history of your new baby, but we recommend focusing entirely on the child and the excitement surrounding this new addition to the family. The goal is to get your close friends and family members excited about adoption, and a quality baby shower will have people talking about the celebration for months! One of the biggest logistical challenges of throwing an adoptive baby shower is deciding when you should host your party. While traditional showers occur a few months before baby arrives, adoptive parents have the choice of deciding to host their event before or after adoption. Each option comes with its own unique advantages and drawbacks. Many adoptive families feel strange about hosting a baby shower before their plans are solidified, as last-second changes can result in heartbreak for everyone if the shower is held too early. As the parents, it’s up to you to decide the best time to host a baby shower, whether it’s following a home study, after receiving a referral, or even waiting until the baby arrives. Be sure to pick a time that you are most comfortable with! The written invites for your baby shower should not differ greatly from traditional showers, except for the wording of the invite itself. It’s important to plan properly for this, as small errors can lead to a lot of confusion amongst your guests. Referring to the party as a shower for your “adopted baby” can carry negative connotations, and utilizing traditional phrases and images can negatively affect your party. Be sure to be precise with your verbiage, but don’t forget to include all of the exciting features you want on the invite! While many adoptive mothers struggle with registering for their baby shower, the truth is that doing so can help a lot in supplying you with the loving gifts needed to outfit a new nursery. Creating a registry is ideal for parents who wait until after the arrival of their new miracle before hosting a baby shower. This way, your guests can provide the clothing, blankets, and toys needed to provide your little one with a lifetime of fun. When it all comes down to it, most adoptive parents are not looking to host a baby shower to better prepare them for the road ahead. Instead, most people are so excited about their new family member that they simply want to host an event for everyone to come celebrate the new addition. In a number of adoption cases, new parents will just be getting through the stress of waiting months for their new child. Now that the hard parts of the adoption process are in the rearview mirror, it’s time to focus on celebrating as a family! Adopting a baby can be a stressful process, but the joys of growing your family will make the effort worth it. Throwing a baby shower is one way to share your excitement with your friends and family while normalizing adoption for everyone involved. As an alternative to any adoption agency in California, A is 4 Adoption is here to provide the best support and guidance to help streamline the adoption process for your family. From comprehensive birth mother help to full-service support for adoptive parents, we do it all to create the best outcome for the baby. Contact us today to learn more!